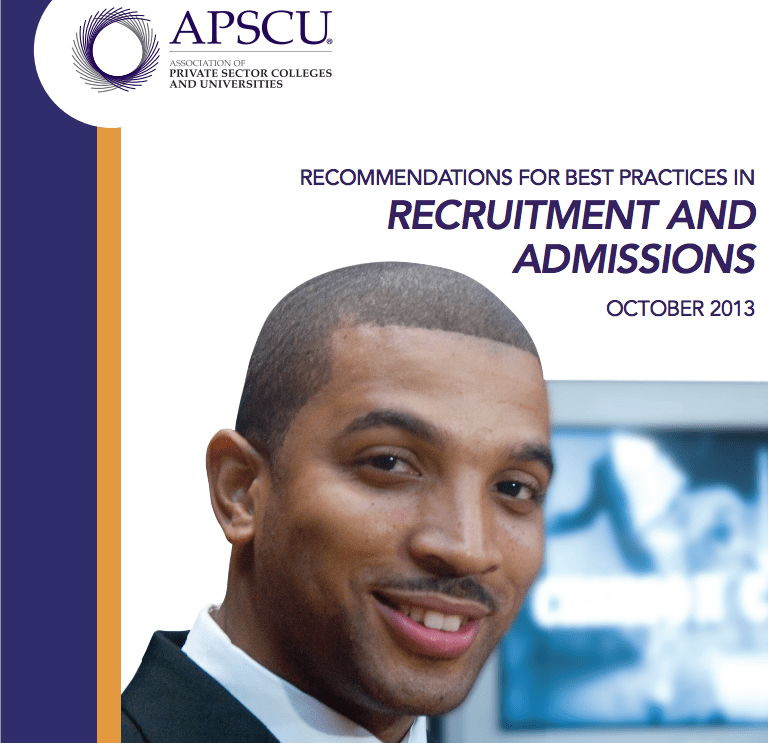 The lobbying group of for-profit colleges, APSCU, today released a report, "Best Practices in Recruitment and Admissions." State and federal authorities, and private lawyers, have been investigating for-profit colleges, and winning settlements, arbitrations, and jury verdicts in cases where recruiters used coercive tactics and made false promises to prospective students about college costs, job placement rates, and other critical matters. So APSCU is trying to show in public that the sector is working to clean up its act, with a booklet advising recruiters to provide students with "clear and accurate information." But, as we've come to expect, APSCU has no shame. The co-chair of the APSCU task force in charge is Jim Hutton of Keiser University. Keiser is a for-profit college that recently converted, on questionable terms, into a non-profit. Just a year ago, to settle charges pursued by Florida's Republican Attorney General, Pam Bondi, Keiser agreed that its recruiters would not, going forward, misrepresent facts about the school to prospective students. Keiser, which admitted no wrongdoing, also agreed to provide misled students with additional free job training. Bondi investigated Keiser for almost two years, based on numerous student complaints that the school had misrepresented things like costs of attending, transferability of credits to other schools, and Keiser's accreditation. Under the agreement with the state of Florida, Keiser may not describe its programs as being in "'high demand' or having limited availability unless such limitations actually exist." Keiser schools can't claim they are "fully accredited" or otherwise misrepresent their accreditation. Keiser may not assert that federal student loans are "without cost," and it must "clearly and conspicuously disclose" that credits won't necessarily transfer to another college. For all I know, Keiser's Jim Hutton is an honest, wonderful guy. But given that Florida's Attorney General recently determined it was necessary to get Keiser to agree in writing to tell its students the truth, it is remarkable that a Keiser official is in charge of APSCU's effort to articulate honest recruiting practices. In an interview earlier this year, Hutton explained that the task force's goals were modest: "We have no intention of creating new 'rules' or policy or procedure manuals for schools to follow; rather, we will publish some philosophical statements and guiding principles that will lift up best practices of ethical and proper student enrollment and communications." In other words, a bunch of bland blather that APSCU can use for public relations, and APSCU members can say they think are swell, but nothing that commits APSCU members to actually stop telling students falsehoods, like inflated job placement outcomes and rates, assertions that programs will cost them nothing out of pocket, claims that high-interest private student loans are federal loans, etc. On the subject of creating new standards, it's not clear what has become of the Coalition for Educational Success (CES), originally led by famed DC mouthpiece Lanny Davis (who has represented dictators and is now the official spinmeister for keeping Washington's football team named the Redskins). CES was purportedly created, by some particularly aggressive for-profit college owners, because they felt that APSCU wasn't forceful enough. CES had recruited, and in at least some cases paid, a number of prominent people, including former Pennsylvania governor Ed Rendell and former New Jersey governor Tom Kean (himself an investor in for-profit colleges), to create and then monitor another effort at self-regulating the industry, called "Standards of Responsible Conduct and Transparency." But CES seems to have vanished. Now, if you click on links to CES and its vaunted standards, you end up on a GoDaddy page telling you the domain has expired. My tweet asking consultant Penny Lee, Lanny Davis's successor running CES, what happened to the group went nowhere. All I know is that Noah Black, who worked at the Harbour Group consulting firm and was regularly listed as a press contact on CES press releases, is now even more tightly engaged with the for-profit college industry. Since March, Black has been Vice President of Communications at APSCU.